For more than 20 years, a roster of well-known and emerging leaders in engineering, technology, creativity and business gathers once a year for a week near Palm Springs, Calif. to discuss, debate, and question the most compelling topics facing the media and entertainment industry. And as is true every year, the 2019 HPA Tech Retreat is shaping up to be a great week of information, networking and engagement. Members of the Media & Entertainment Services Alliance (MESA) can receive a 10% discount on registration, by using the code PCMESA10. 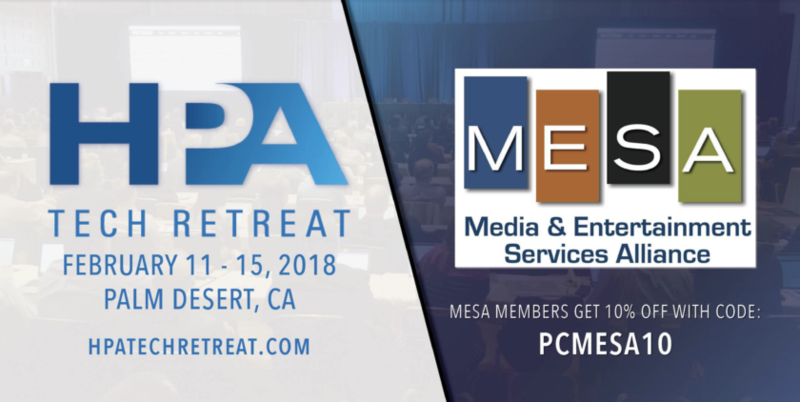 And nearly 20 MESA members are scheduled to present and attend the retreat, including Adobe, Amazon Web Services, Avid Technology, Dolby, GrayMeta, G-Technology, Microsoft Azure, NAGRA, Pixelogic, Prime Focus Technologies, Salesforce, Signiant, Sohonet, Sony, Technicolor, Teradici, Video Gorillas and Western Digital. The conference program and speaker list, which is still growing, focuses on topics that are of keen interest to an industry in constant evolution. The week kicks off Monday, Feb. 11 with TR-X (Tech Retreat Extra) a half-day session, this year focusing on eSports and keynoted by ESL North America CEO Yvette Martinez-Rea. The presentation “Dropping the Mic on Center Stage,” TR-X will look at the rapid growth of eSports and the role that technology plays. The Tuesday, Feb. 12 Supersession, “Industry Climate Change is Real: Are Snowflake Workflows Melting?” takes a deep dive into HDR, UHD and cloud-based workflows as they converge. The Supersession will explore how filmmakers, content creators, and tool and service providers are pushing the boundaries to streamline the production, post and delivery of unprecedented amounts of content at unprecedented levels of quality and complexity. Wednesday through Friday, program chair Mark Schubin and a program committee of experts have put together a jam packed series of sessions that cover a wide array of important topics including perennial favorites The “Broadcasters Panel” and “The Washington Review” which share the docket with panels that explore remote production, drones, ACESNext and the Academy Digital Source Master, the Cloud, AI in post, maintaining the image, and Deep Fakes, to name but a few. The HPA Tech Retreat also features its Innovation Zone, a curated space where companies with groundbreaking technologies share their latest products. Mornings kick off with breakfast roundtables, where dozens of topics are explored by industry thought leaders, and ends with cocktail receptions and nonstop conversation.